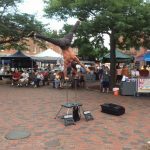 Experience the Yankee Homecoming Market Place in the heart of Newburyport’s historic and downtown from 10 am to 10 pm daily from July 28th – August 5th. 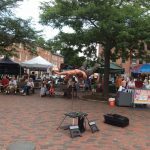 Eat, shop and be entertained daily in Market Square, and surrounding streets. 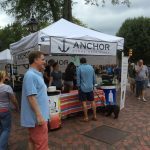 Follow the scent of the outdoor grilling to the many savory food choices and, explore all sorts of outdoor shopping, crafts and other fun things to do. 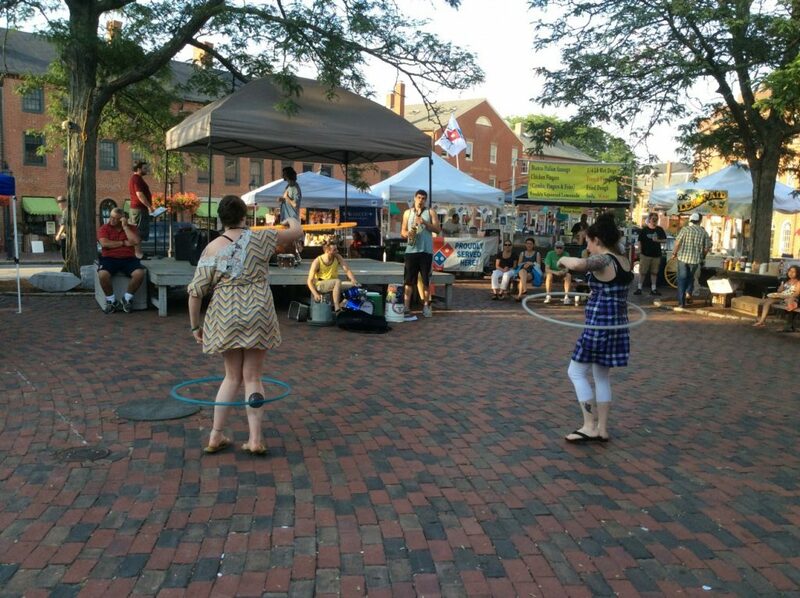 Make sure to catch daily entertainment at the Market Square stage as well as the Waterfront stage. 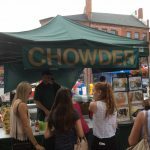 The Yankee Homecoming Market Place offers a wonderful variety of food options so your certain to find something for everyone. 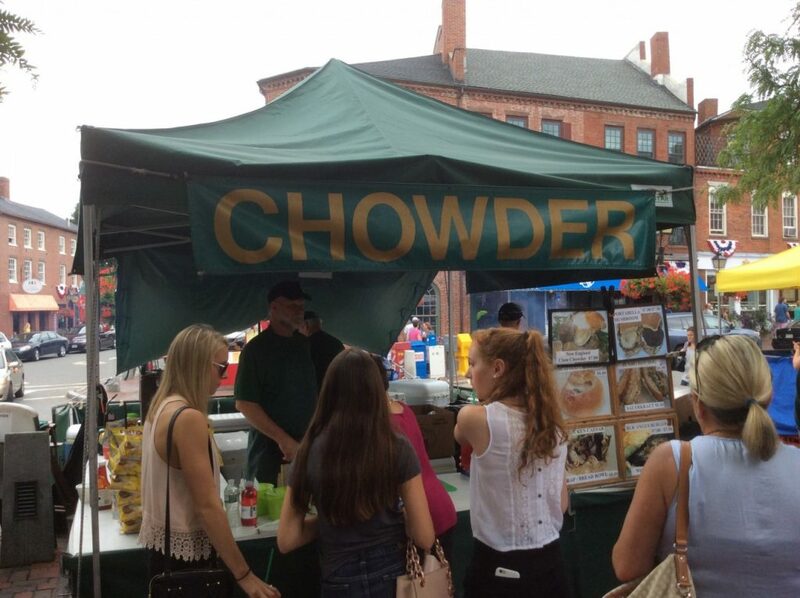 In addition to the standard outdoor vendor options of burgers, hot dogs, sausages fries and pizza, you will also find seafood vendors, Chinese, Indian, Italian, Mexican and delicious Greek food as well. 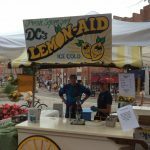 Make sure to save room for sweet treats and refreshing, cool treats as well, maybe an Italian Ice, or traditional fried dough. 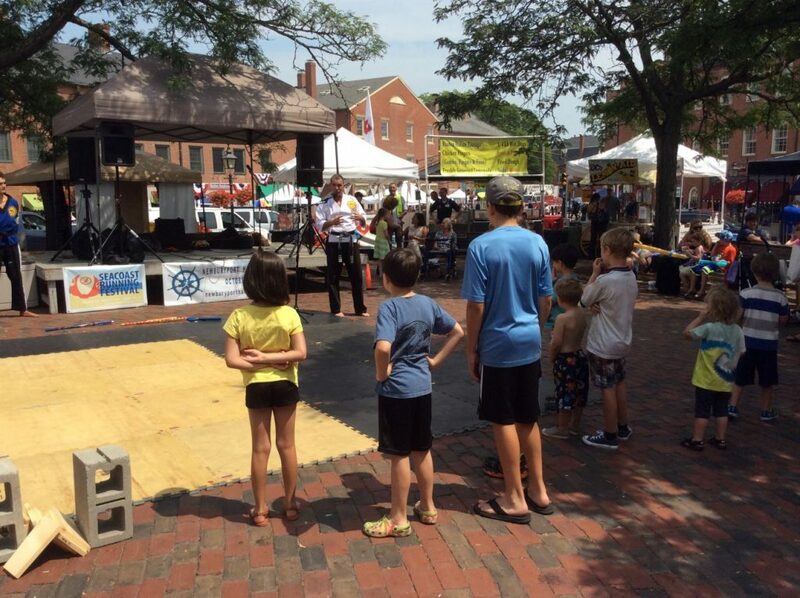 Grab a seat on one of the benches in Market Square and enjoy live entertainment from the Market Square stage or take a walk down to Waterfront Park to check out what’s happening on the Waterfront Stage. 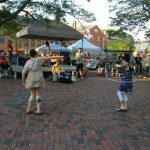 Downtown Entertainment runs daily from 10 am – 5 pm, and you can view the 2018 entertainment schedule for both the Market Square Stage and the Waterfront Stage. In the evenings during Yankee Homecoming you can also enjoy the Yankee Homecoming Waterfront Concerts. 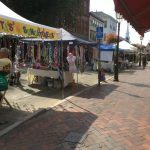 As part of the Yankee Homecoming Market Place you can enjoy the Market Square Craft Day on Tuesday, July 31st from 10 am – 7 pm. The rain date is Wednesday, August 1st. 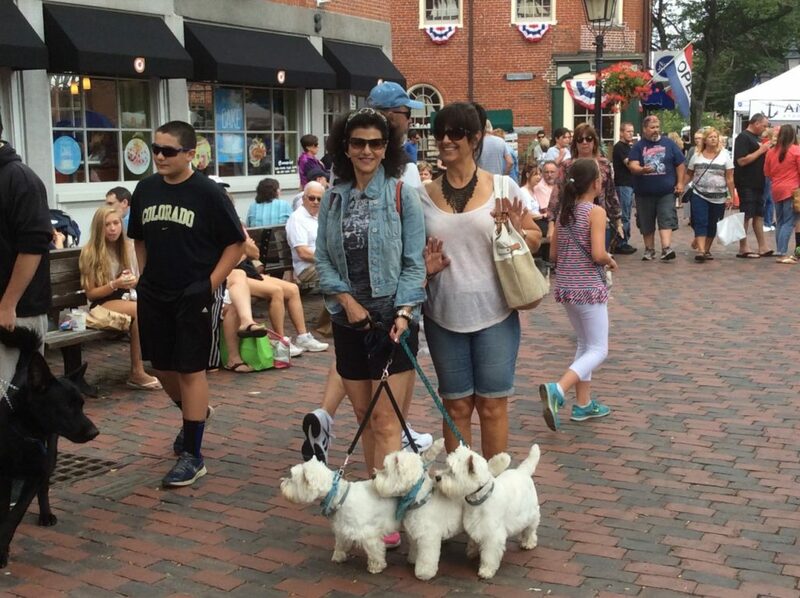 The Inn Street Aritsans Revival runs from July 28th – August 5th featuring artisans and crafter from Newburyport and the surrounding area. 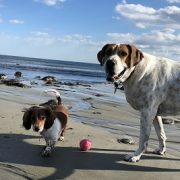 Check the Newburyport.com Events Calendar for more details on these events. 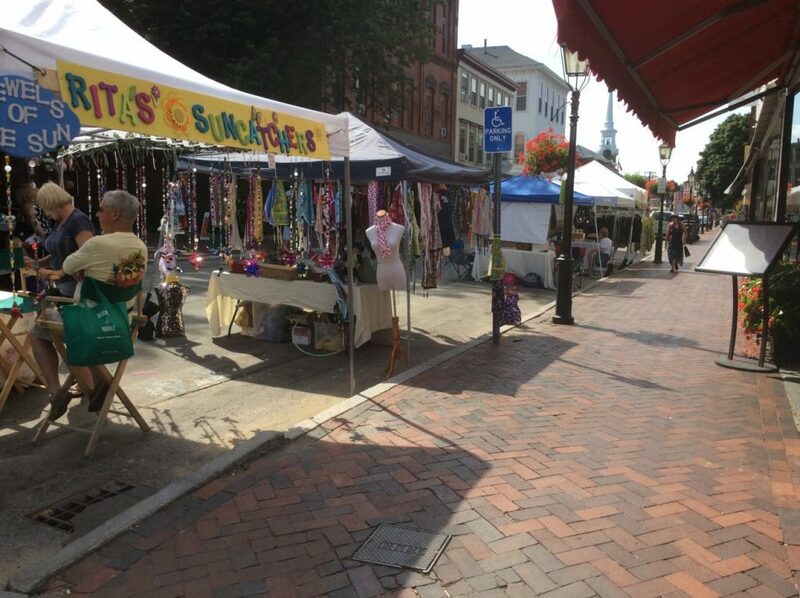 The Yankee Homecoming sidewalk sales are another great extension of the Yankee Homecoming Market Place. 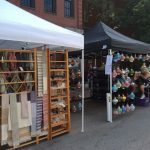 You will find tents with all sorts of great merchandise on the streets surrounding Market Square: State Street, Pleasant Street and Inn Street too. The sidewalk sales run Thursday, Friday and Saturday, August 2nd, 3rd and 4th. The sidewalk sales are a great way to support our local retailers and find some great deals! 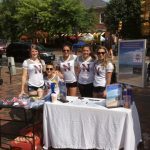 While in Market Square make sure to visit the Yankee Homecoming table and purchase a raffle ticket to win a chance at a week’s vacation, a $36,000 prize for home or many cash prizes. 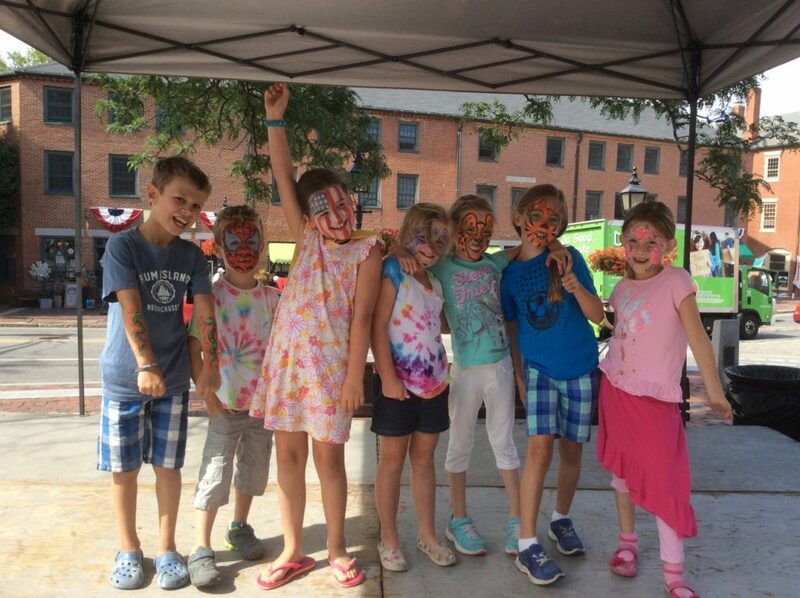 The kids can get get their face painted, play on the Inn Street Playground or cool off in the Inn Street fountain! 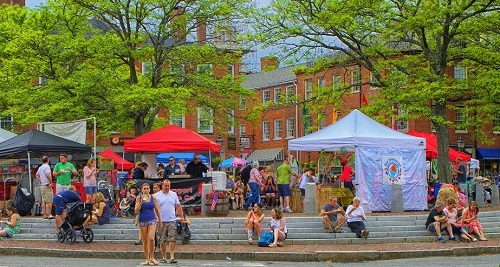 The Yankee Homecoming Market Place runs from 10 am – 10 pm daily in Market Square and surrounding streets. If you enjoy saving money, make sure to purchase a Newburyport VIP Card, to receive discounts at 180 Greater Newburyport restaurants and shops. You can use your VIP Card every time you visit any of the participating businesses and help support Yankee Homecoming Fireworks. Purchase one card for $25 or two for $40 and donate $10 of your purchase to help pay for our spectacular firework display. Choose if you would like a traditional Physical VIP Card valid until 12/31/18 or a login for Digital VIP Card display in the “Newburyport” App. The digital VIP Card is valid one year from purchase. VIP Cards will be available for sale at many Yankee Homecoming Events but can also be purchased or online. 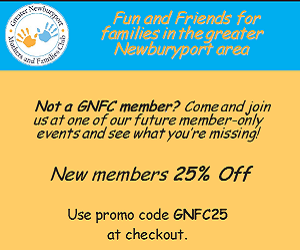 If you enjoy using Apps, type “Newburyport” in the App Store or Play Store and select “VIP Card Discounts” to view participating businesses and discounts. 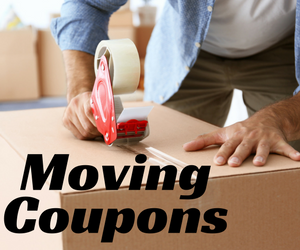 You can purchase directly through the App, for immediate activation, and make sure to select YANKEE HOMECOMING FIREWORKS to receive $10 of your purchase. 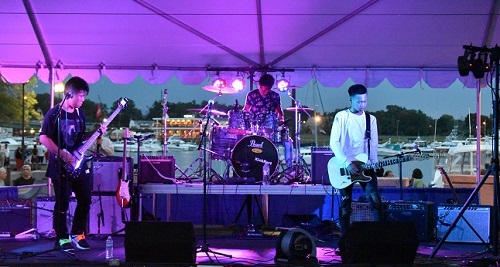 Each year local high school students from Newburyport and surrounding towns help kick off Yankee Homecoming week as they compete in the annual High School Battle of the Bands. 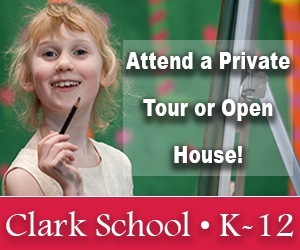 Mark your calendar for Friday, July 27th from 5 – 9: 30 pm. 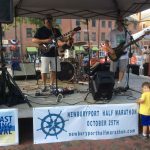 Bands perform on the Waterfront Park stage featuring a collection of family-friendly songs for cash, prizes and the opportunity to be the opening act, Sunday night of the Yankee Homecoming Waterfront Concert Series. Come cheer for and support these up and coming local bands as they compete for the High School Battle of the Bands title. If your interested in participating, make sure to register by midnight on July 17th. View the registration form for complete rules and regulations. As part of the Battle of the Bands competition rules, one band is accepted on a first come first serve basis from each of the following: Newburyport High, Amesbury High, The Governor’s Academy, Pentucket Regional High, Triton Regional High, The Musical Suite, West Newbury School of Music, and Zach Field Drum Studio. Additional bands are then selected based on contest availability. 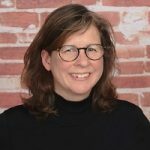 Elizabeth de Veer is a writer who lives in Georgetown, MA. Her hobbies include organizing her elementary school-age daughter and chasing her labradoodle. Favorite coffee: hot. Favorite Beatles album: Sgt. Pepper. Favorite naughty food: lobster roll and fries. Her first novel is due to be published in winter 2019. This year, Yankee Homecoming will kick off with the third annual Kayak and Sup River Races on the Merrimac River, on Saturday, July 28. Contestants in the Kayak and SUP River Races must be at Cashman Park to check-in at 10:00 am and the race will start promptly at 11:30. Online registration should be done prior to race day. All registrants will receive an event t-shirt, designed by Paddle Paddle Surf Apparel, and names will be entered into a drawing for tickets to attend the Yankee Homecoming Brewfest, happening that night. Organizers are working hard to make this exciting event as fun to watch as it is to participate in, so grab your kayak or stand-up paddle board and join in, or watch from shore and cheer on your favorites; a great time is guaranteed. Competitors will launch kayaks and stand-up paddle boards into the Merrimac River at the Cashman Park boat ramp off Merrimack Street and after a safety review, paddle up river past Ram Island, Carr Island and around Deer Island, then back to Cashman Park and the finish line for a total of 4.6 miles. This year’s Kayak and SUP River Races has several divisions: kayakers will compete for Elite, Recreational, Tandem, and Over 60, first, second and third places, male and female. Stand-up paddle boards will compete for first, second and third places and winners will receive a medal. This year, Race Wire is handling all registrations and providing professional timing for the first time. This means that competitors in the Kayak and SUP River Races will get their time and photos sent to them moments after they cross the finish line. Participants come from all over New England to join in this fun and exciting event, and organizers are expecting around 150 competitors. 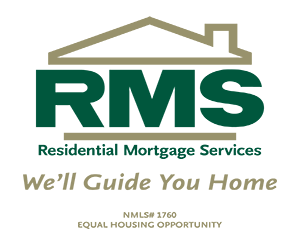 The event also has some new sponsors this year, including REI who will have a tent with give-aways and lawn games in the park. The course should take average kayakers or stand-up paddle-boarders around 30-40 minutes to complete, so spectators have time to enjoy a picnic lunch by the river and play games while they cheer on the contestants. Organizers put safety first and enlisted the help of the US Coast Guard to pick the safest time for racers to take on the rushing Merrimac River. On race day, there will be several motor boats in the water to supervise and assist boaters and paddle-boarders who need it. Alcohol is prohibited, and all participants must have a USCG approved flotation device and a race whistle. Inspectors will review all equipment before they allow racers to launch. THIS EVENT IS SOLD OUT. Get ready for the 2018 Yankee Homecoming Brewfest on July 28, from 5 – 9 pm. 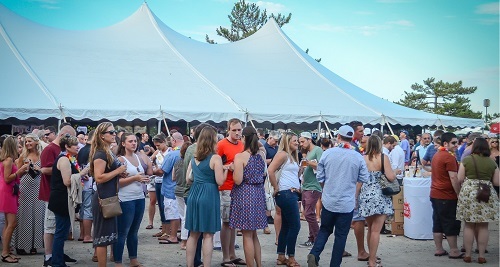 Brewfest takes place along the beautiful shoreline of the Merrimack River under a huge tent located next to the Newburyport the boardwalk. Yankee Homecoming Brewfest is the ideal opportunity to satisfy your curiosity about local craft beers, discover some new breweries or revisit some of your favorite brews! The event is host to over 20 local and regional breweries featuring over 40 local craft beers and ciders. Come sample some new styles and varieties of craft beers and view the list of participating breweries below. Brewfest will features awesome live music courtesy of Freevolt and there will also be food available from Domino’s and the Deck. The huge tent that is set up for the event means Brewfest will happen rain or shine! 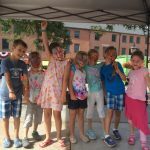 While Yankee Homecoming features many events for families and people of all ages, Brewfest is a really fun occasion for adult only! Only folks aged 21+ with a valid form of identification will be admitted. No children or pets are permitted. Make sure to purchase tickets for Yankee Homecoming Brewfest as soon as possible because this popular event sells out every year. 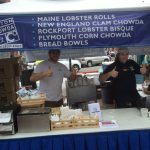 Over 20 local and regional breweries will be present at the Yankee Homecoming Brewfest including: Allagash Brewing Company, Bell’s Brewing, Blue Point Brewery, Cigar City Brewing, Cisco Brewers, Downeast Cider House, Elysian Brewing Co., Global Beer Network, Goose Island, Guinness, Half Bottle Cans, House Bear Brewing, Kona Brewing Company, Newburyport Brewing Co., New Belgium Brewing, Oskar Blues Brewing, RiverWalk Brewing, Shock Top, Smirnoff Seltzer, Stella Artois, Tröegs Brewing Company, True North Ale Company, Wachusett Brewing Company and Wormtown Brewery. Make sure to check back as the list of confirmed participants will continue to increase. If you enjoy dining and shopping in our local community, you can support the Yankee Homecoming Fireworks by purchasing or renewing your Newburyport App and VIP Card. The VIP Program allows you to enjoy discounts at 180 restaurants and shops in the Greater Newburyport community and $10 of each purchase or renewal can be donated to the Yankee Homecoming Fireworks Fund. If you don’t already have the Newburyport App, just type the word “Newburyport” in the App Store or Play Store or use the links below from your mobile device. 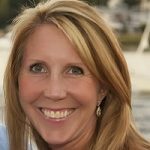 Owner of Newburyport.Com, Laura manages Business Development, Fundraising, the VIP Program, Blogging and the Events Calendar. 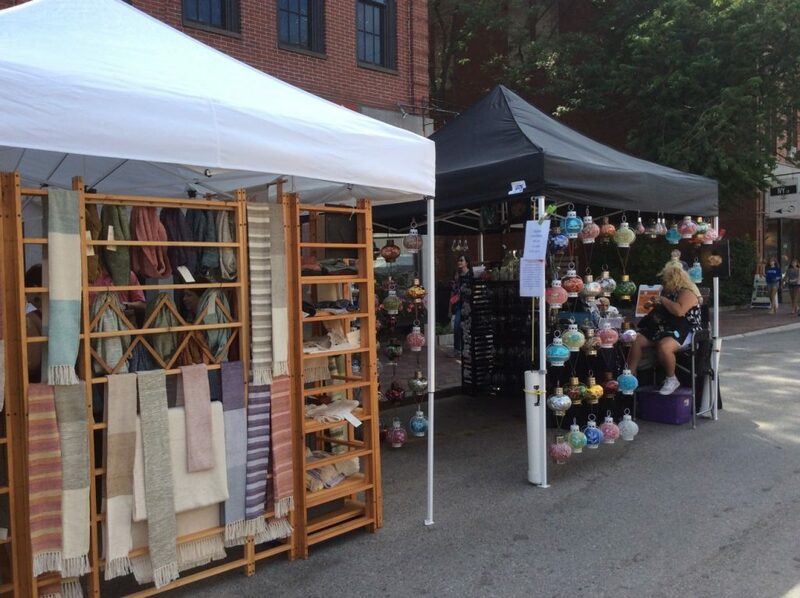 Come experience Art on Bartlet Mall, Saturday July 28th and Sunday July 29th from 10 AM – 4 PM. 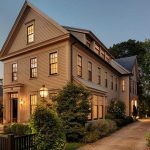 In Newburyport on the corner of High Street and Pond Street, the art is exceptional and the setting is picturesque. 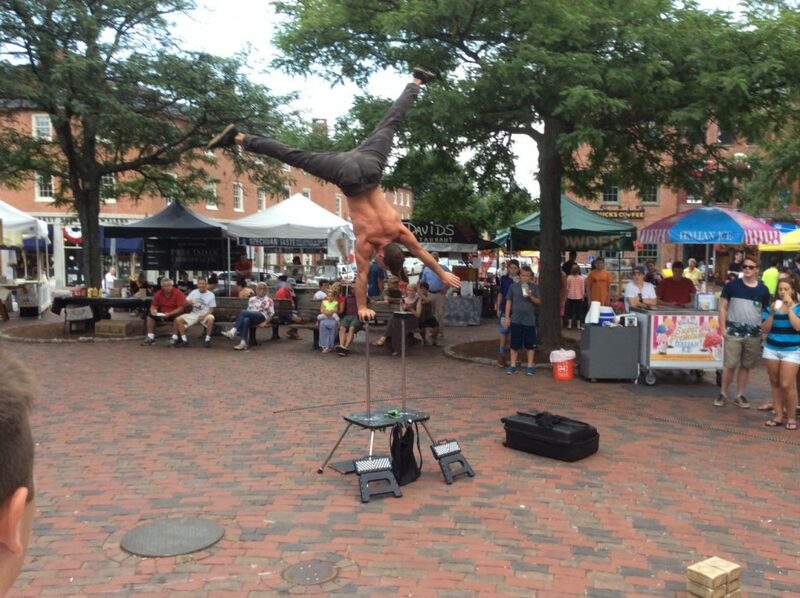 Art on Bartlet Mall is a Newburyport tradition for the past 35 years. Enjoy works from over 60 local and regional artists showing all media of work, including a few hand-pulled printing artists. 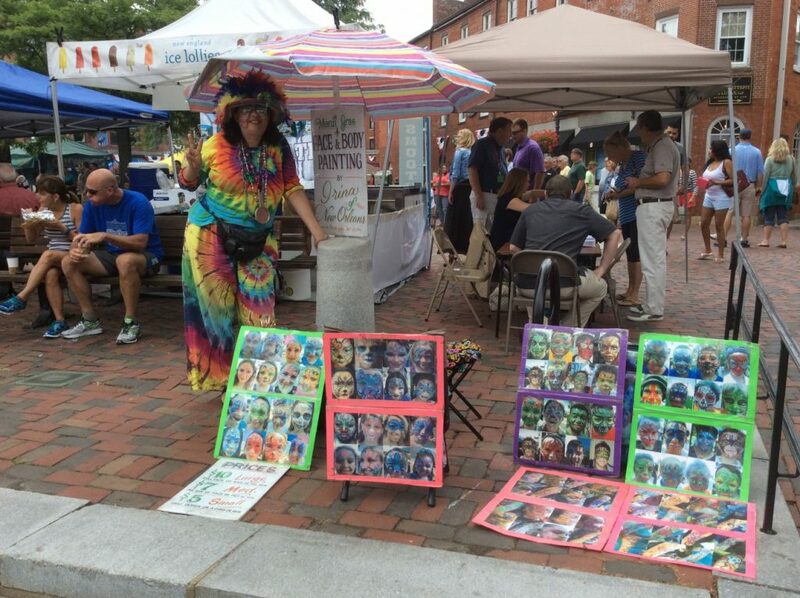 The artists are from Massachusetts, Maine, New Hampshire, and even New Jersey. There are award winners in over half of the participants. Stroll along the path that surround the pond and features a beautiful fountain in the center. 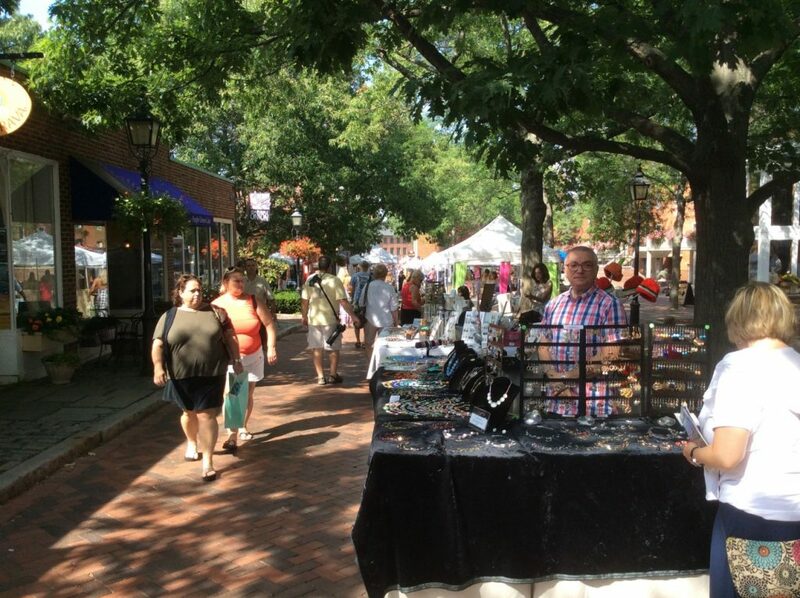 Bartlet Mall is the setting for the premier Yankee Homecoming art show and is one of the most photographed places in Newburyport. 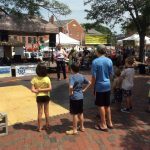 The 2nd day of the show shares the space and coincides with another major Newburyport family tradition, Old Fashion Sunday. 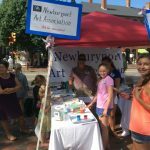 Art on Bartlet Mall is a free event for the public to attend. 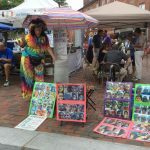 Participating artists pay a fee to feature their art and these fees are used to support the Yankee Homecoming Committee efforts. 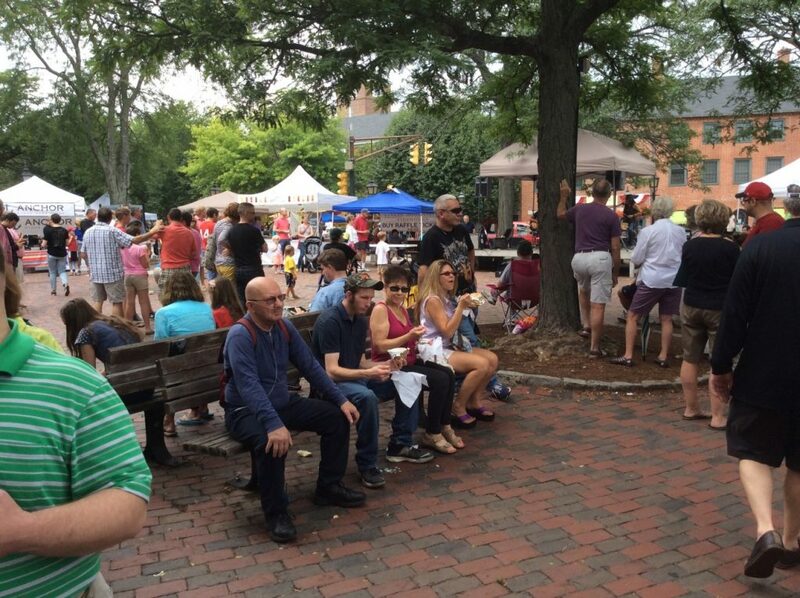 If you work up an appetite after enjoying the beautiful works of art, you could take a walk down to the Greek Food Festival just a couple of blocks away on Harris Street, or you can visit one of the the many wonderful restaurants in downtown Newburyport. If you appreciate dining and shopping in our local community, you can support the Yankee Homecoming Fireworks by purchasing or renewing your Newburyport App and VIP Card. The VIP Program allows you to enjoy discounts at 180 restaurants and shops in the Greater Newburyport community and $10 of each purchase or renewal can be donated to the Yankee Homecoming Fireworks Fund. Are you ready for a day of outdoor fun, games, and entertainment? Get ready for Yankee Homecoming Olde Fashioned Sunday! This year’s event will be held Sunday, July 29th from 10 AM to 4 PM. 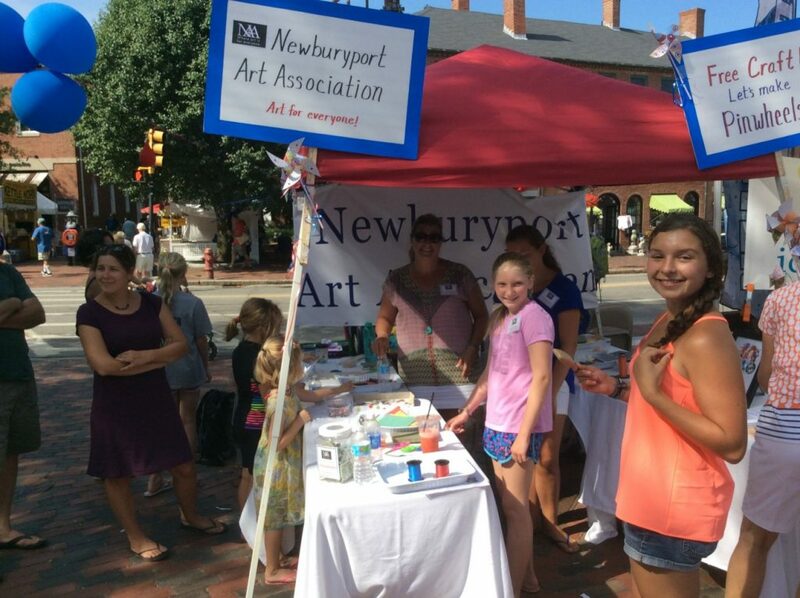 This is a classic Newburyport family event where children of all ages enjoy a fun and exciting array of activities. 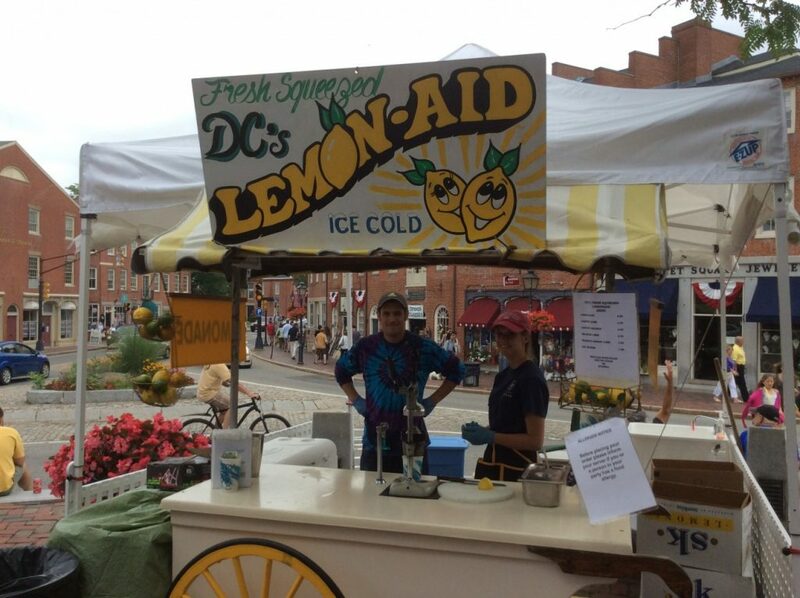 The setting for Yankee Homecoming Olde Fashioned Sunday is on Bartlet Mall, a beautiful and picturesque area at the intersection of Pond Street and High Street in Newburyport. This event is an opportunity to kick off Yankee Homecoming week in Newburyport while making wonderful memories with family and friends. There are so many fun activities to enjoy. Yankee Homecoming Olde Fashioned Sunday begins with folks displaying their favorite pets on stage. There will be entertainers playing music and performing dances from the 1960s. This is a great opportunity for folks to wear clothing from the era, including bell-bottom pants and tie-dye shirts! 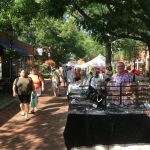 Art on Bartlet Mall is another very popular event that takes place at the same time and location as Olde Fashioned Sunday. There will be regional artists displaying and selling their amazing original work on Bartlet Mall. Be sure to check out the beautiful drawings and paintings by local artists at Yankee Homecoming Olde Fashioned Sunday. 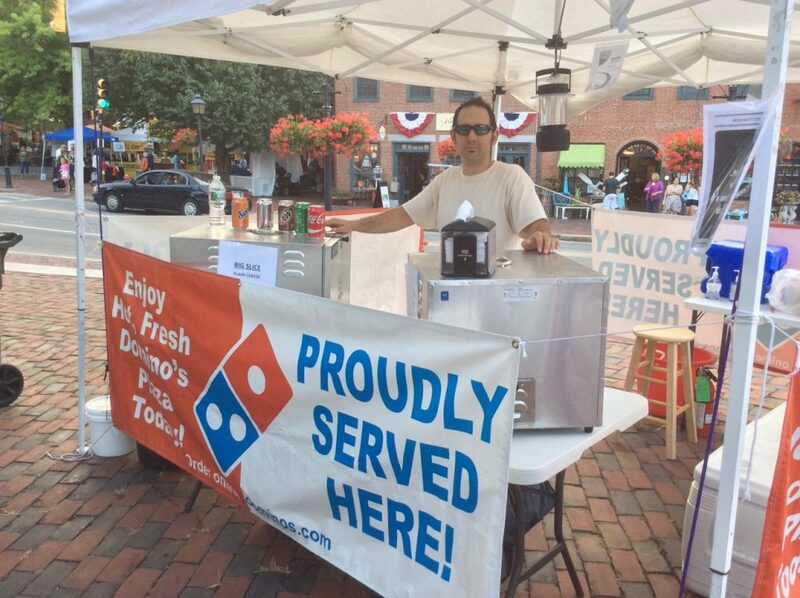 You can enjoy Art on Bartlet Mall both Saturday July 29th as well as Sunday, July 30th during Olde Fashioned Sunday. 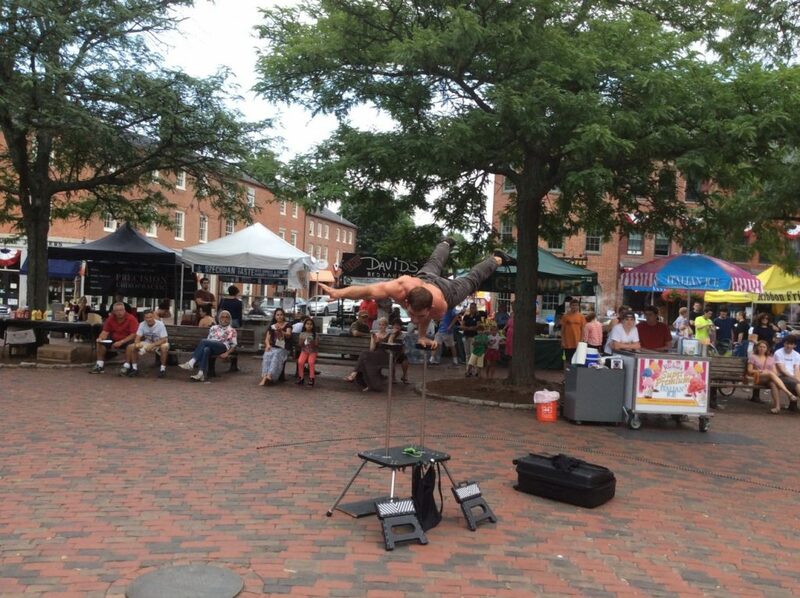 Art on Bartlet Mall runs from 10 AM – 5 PM each day. Kids will love the free activities at the Family Midway event. Enjoy some old fashioned games as a family, such as the egg in spoon race and three legged races. 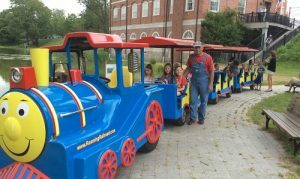 Kids can take a pony ride, enjoy face painting, and train rides around the pond! There will also be a classic car display, water safety tips, K9 demonstrations, and many exciting professional wrestling matches on the lower green. If you have kids, Yankee Homecoming Olde Fashioned Sunday is sure to be a favorite, but make sure you also mark your calendar to attend Family Day at Maudslay State Park on August 5th. 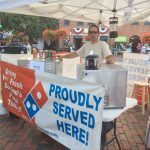 When you get hungry during Yankee Homecoming Olde Fashioned Sunday there will be plenty of vendors cooking up delicious snacks. There will also be old-fashioned candy and popcorn available for purchase. That’s right, there will be tasty candy and snacks. New this year you can register your RC car for the first Yankee Homecoming RC Car Race. Enjoy the beginning of Yankee Homecoming week and all the fun events for people of all ages at Yankee Homecoming Olde Fashioned Sunday! The 2018 Yankee Homecoming Golf Tournament will be held on Monday, July 30th at Olde Newbury Golf Club. The Tournament which is open to both men and women, kicks off at 8 AM with a shogun scramble. The raffle and silent auction will run throughout the Yankee Homecoming Golf Tournament, followed by awarding of prizes with a cash bar cocktail hour. Be ready to play your best, as there is a $10,000 cash prize for getting a hole in one on the sixth hole! After the tournament, participants and guests will proceed to the dock at Waterfront Park to board the Captains Lady at 4 PM for a dinner cruise hosted by the Starboard Galley Restaurant. The menu will include: Caesar Salad and pasta salad, Sirloin Steak Tips, Grilled Chicken and Shrimp, rolls & butter followed by Strawberry Shortcake. The Yankee Homecoming Golf Tournament is always a very popular tournament so register ASAP by contacting Gary Greco at 978-462-1326 to reserve your spot. You can also reach out to Gary to sponsor a tee or donate a raffle prize. The Tournament Cost is $140 Per Person (Includes Carts, Continental Breakfast, Lunch, Harbor Cruise & Dinner.) Guest fee is $30 to bring a spouse or guest on the Harbor Cruise. NET proceeds for this event go to support the efforts of the Yankee Homecoming Committee. 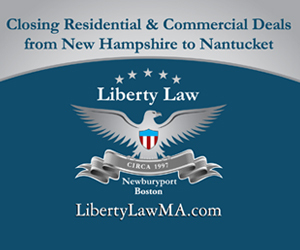 Use 305 Newburyport Turnpike in your GPS as the Address for Olde Newbury Golf Club. July 31st, 2014 was a day filled with birdies, bogies and pars for most, except Paul Mahoney. 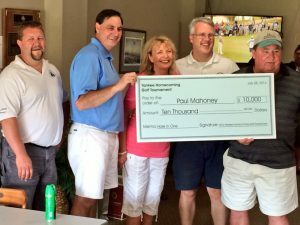 Unlike any other year, Paul played the 9-hole course with a crew of friends. Throughout the day they joked and laughed with each other about various ‘swings and misses,’ until there was nothing to joke about. 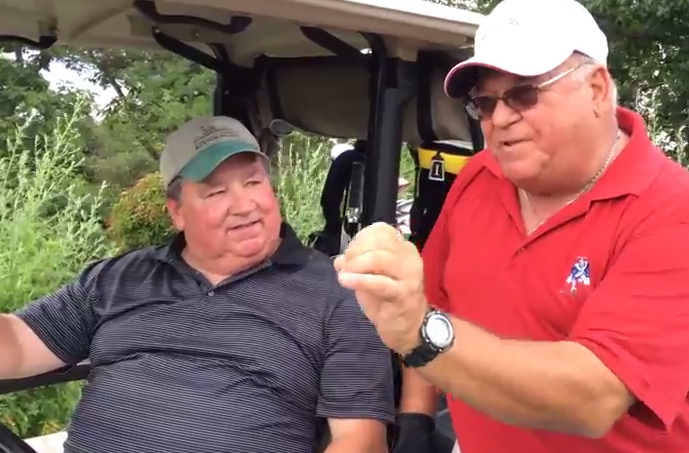 “A number 6 iron, he hit the ball, a perfect swing, it landed three feet before the hole and BOOM, hole in one!” said Paul’s friend and teammate. And to the victor goes the spoils, a $10,000 prize. According to Yankee Homecoming President Micheal Volpone, this was the first hole-in-one in the tournament’s 30 year history. On the hole Paul made the eagle, there was also a double your money raffle for landing a tee shot on the green in combination with being the closest shot to the pin. Given Paul’s hole in one, he also sank this award. Paul, who’s been playing golf since he was a kid, says nowadays it’s more luck than anything. When asked what he plans to do with the money, Paul said he is soon to take his wife on a couple’s trip to Alaska. We’d also like to give a shout out to the winners of the tournament, the Miller – O’Meara – Shelly & Morris Team. Caitlin is a freelance editor/writer and former news producer for CNN. 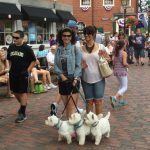 As a local mom of three, her family can be found enjoying all Newburyport has to offer, from strolling downtown to biking the rail trail to swimming at the beach. Whether you have a little Coast Guard in training at home, or you would like to meet the men and women that protect our city, the US Coast Guard Open House has something for everyone. The Merrimack River Coast Guard Station, located in downtown Newburyport at 65B Water Street, will be opening its doors to the public Thursday, August 2nd from 10 am to 2 pm, for a special day of tours and information. As part of the town’s Yankee Homecoming celebrations, The US Coast Guard Open House offers a special opportunity for locals and tourists to step inside this iconic station. Visitors are welcome to explore the different areas within, all which will be manned by crew members offering information and taking questions. And perhaps one of the most exciting parts of the visit, is the opportunity to step aboard some of the US Coast Guard boats. While the boats will remain at the station, boat enthusiasts will be allowed to explore the decks while learning about special features. Make sure to bring your cameras and snap a pic in the Captain’s seat! A special boating safety stand will also be set up at the station, offering up information and tips on how to navigate a boat safely. 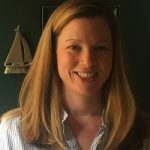 Learn about some of the challenges our local waters present, the hazards of the Merrimack River entrance, and life saving techniques. For those visiting with little sea farers in tow, the Coast Guard Open House will also have Coastie on hand. The Coast Guard’s robot boat is equipped with navigation, searchlights, a rotating beacon, siren and air horn, sure to impress the little ones. Coastie will interact with young boaters and teach safety rules like “always swim with a buddy in a supervised area”. Watch out though, Coastie is also equipped with a squirt gun that he is known to use to get a laugh from the kids, so don’t be surprised if you get a little wet. Newburyport, designated one of only 21 Coast Guard cities, is the birthplace of the Coast Guard. The Merrimack River Coast Guard Station is the home to the men and women protecting our waters with search, rescue and law enforcement. This Coast Guard Open House is a great opportunity to meet and interact with the crew of our local station and thank them for their hard work. 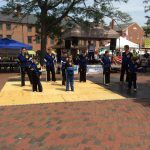 For a full list of events happening during Newburyport’s Yankee Homecoming week visit our Events Calendar and consider supporting the Yankee Homecoming Fireworks fund by purchasing a Newburyport VIP Discount Card. Do you like the idea of relaxing to amazing live music with picturesque water views? 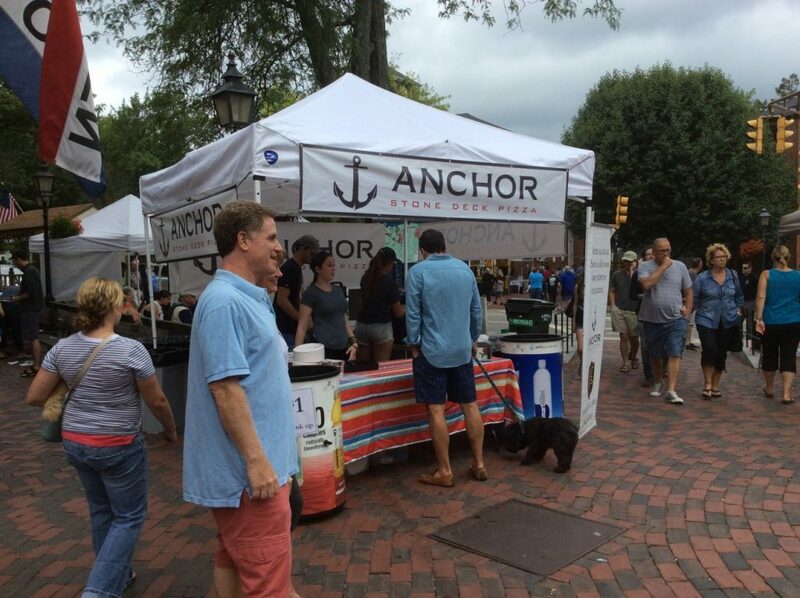 Get ready to enjoy some gorgeous Newburyport summer nights featuring awesome live music when you attend the Yankee Homecoming Waterfront Concerts. 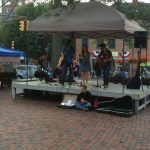 The 2018 concert series runs from Sunday, July 29th through Saturday, August 4th. Check the concert schedule and read more about your favorite bands below. You will find a few that everyone associates with the Yankee Homecoming Waterfront Concerts, and a couple of cool new surprises too. Grab your chairs and blankets and come experience the Yankee Homecoming Waterfront Concerts with your friends and family! 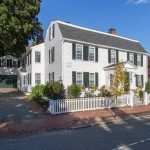 If you are looking for some fun things to do in Newburyport before the free live concerts we recommend a walk along the boardwalk, a visit to the Custom House Maritime Museum, and shopoing at our many inviting local shops. 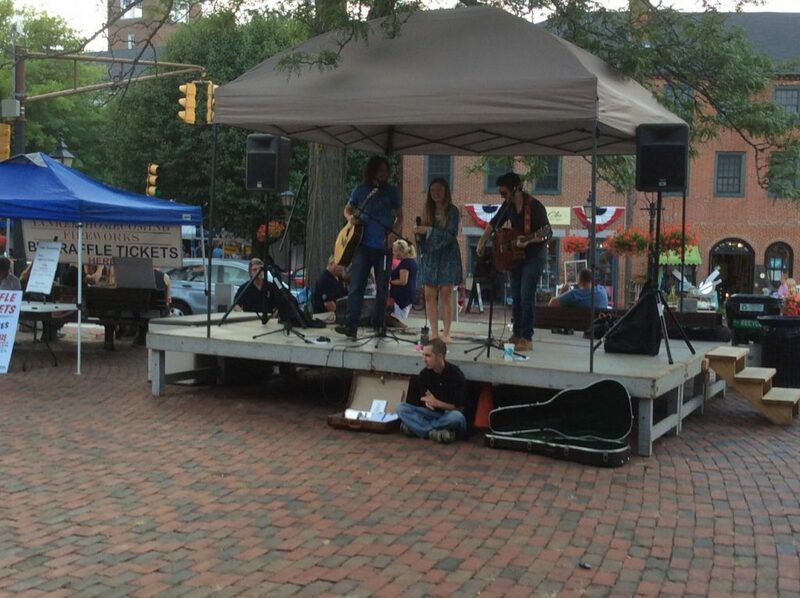 If you prefer, you could relax on a comfortable bench and enjoy the live entertainment in historic Market Square! 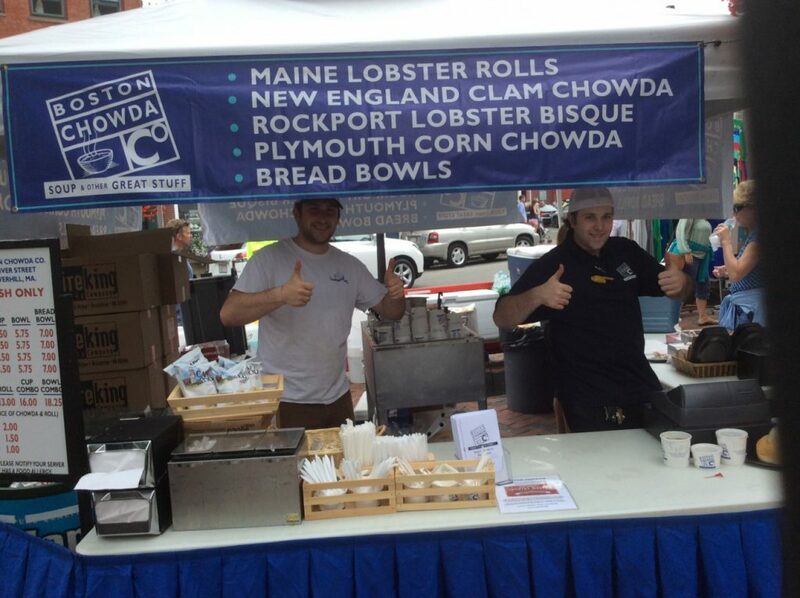 During Yankee Homecoming Waterfront Concerts and throughout Yankee Homecoming there is delicious food to enjoy from vendors and a wide variety of superb restaurants in Newburyport. 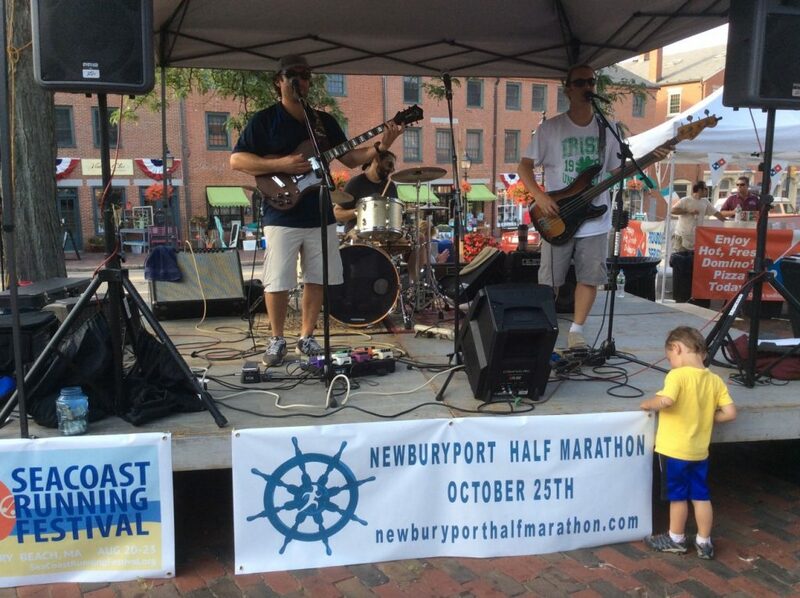 Enjoy the Yankee Homecoming Waterfront Concerts, a free live music series on the water, a Newburyport tradition! 7:30-9:00 PM – Slainte (slan-chuh) Irishspeak for cheers! See below to learn more about the 2017 Yankee Homecoming Waterfront Concerts Bands. Sláinte is a group of 9 friends and musicians, specializing in upbeat Irish folk music. Formed in a dorm room at Boston College, Sláinte has been entertaining crowds throughout New England since 2012, and New York/New Jersey since 2017. With upbeat sets featuring a wide range of tunes from Irish classics to Dropkick Murphys covers, and everything in between, Sláinte always brings the craic! Overdrive is an eight-piece band with a tight and incredibly funky rhythm section as the driving force behind a killer four-piece horn section that features two… trumpets, woodwinds, and trombone. Dance music from the past three decades, music by Chicago, Tower of Power, the Average White Band, all the number one brass-rock hits, and a large selection of swing and songs from the Stax and Motown eras make up an exciting and exhausting performance. After moving to North Shore Massachusetts from the Midwest in 2007, Annie Brobst has become one of New England’s most talented country singer/songwriters. Her first full-length CD “My First Rodeo” was recently released with much acclaim. In 2017, she was named New England Music Awards’ “Female Performer of the Year” across all genres and she is also currently New England Country Music Award’s “Local Female Artist of the Year” (for the 2nd consecutive year). Celebrating 35 years performing live music, the B Street Bombers has been one of the most highly sought after show bands in the Boston area, bringing high energy, world class music to any venue! Formed in 1981, the band is enjoying an unprecedented successful run, and the band has received tremendous notoriety of an outstanding level of musicianship. Beatlejuice doesn’t mimic the Beatles, they honor them! Widely recognized as the finest interpreters of Lennon & McCartney, Beatlejuice combines wonderful vocals, great musicianship and true respect for their heroes. Playing special tribute to the late Brad Delp will be friends Mike Girard and Joe Holaday (Newburyport’s own) of “The Fools” along with Jim Rogers, Buddy Bernard, Steve Baker, John Muzzy and Bob Squires. This will be an evening of celebration, love and remembrance and the greatest rock ‘n roll music ever written. Fortune is an 1980s rock band that had a number of hits including “Airwaves” from The Last American Virgin movie soundtrack and from their second 1985 album release including: “Stacy,” “Dearborn Station,” and “Thrill of it All.” This 6 piece band has a reputation for smooth 3 and 4 part vocal harmonies and some of the most talented musicians this area has ever produced. They play hits by Queen, Journey, Boston, Led Zeppelin, and some originals. The internationally acclaimed Compaq Big Band is an authentic 20-piece big band, with that classic big band sound. They’ve kept New England swingin’ since 1975, with a big band repertoire that begins with the classics from the 30s and 40s as performed by the bands of Glenn Miller, Artie Shaw, Tommy Dorsey, Count Basie, Duke Ellington, and other greats. They balance instrumental charts and horn features with vocal numbers such as those popularized by Frank Sinatra, Ella Fitzgerald, Billie Holiday, Bobby Darin, Frankie Randall, Nancy Wilson, Diane Schuur, and many more. Enjoy Family Day at Maudslay State Park, a free family event during Yankee Homecoming Week in Newburyport! The event takes place Saturday, August 4, from 10 am to 2 pm. Family Day at Maudslay State Park is a Yankee Homecoming tradition for many families. It’s easy to see the appeal! Enjoy free games, crafts, live music, and other performances in picturesque Maudslay Sate Park. Family Day at Maudslay State Park is a great opportunity to enjoy the outdoors and the beautiful location of the park in Newburyport on the Merrimack River. Take in the exquisite gardens, expansive rolling meadows, and the huge pine trees that grown in the park. 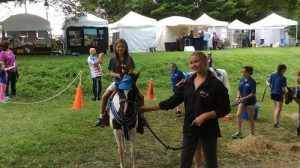 Check out all the booths with free fun activities including, pony rides, petting zoo crafts, a touch tank, fingernail painting, a temporary tattoos, and more! 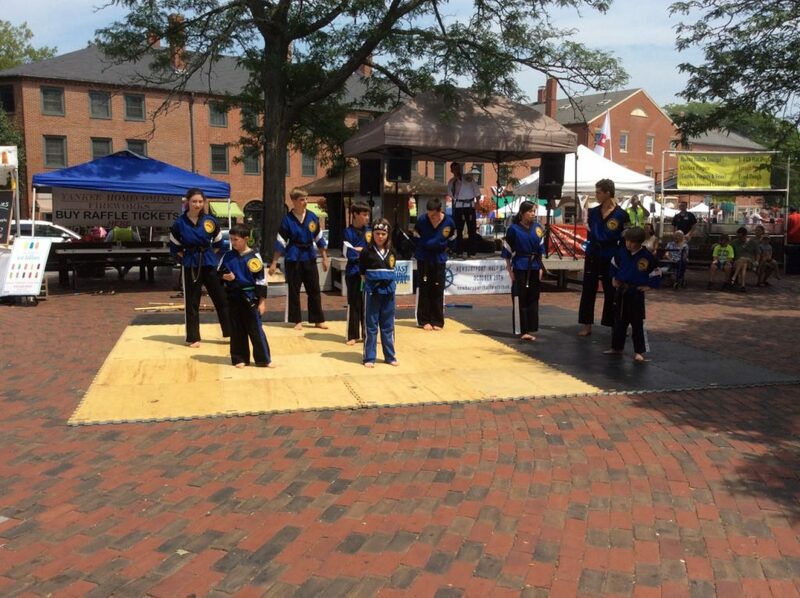 There will be several opportunities for kids to watch and learn including karate and boating safety demonstrations. In addition, the US Coast Guard Auxiliary and U.S. Coast Guard will be on hand to offer information about boating safety and how to be sure your life vest is the right fit for water activities. You can bring your own life vest and they will help fit it for you. Local food vendors: Domino’s and Hodgies TOO will be on site providing an opportunity to purchase food and sweet treats. Below is the schedule for the main stage. If you enjoy dining and shopping in our local community, you can support the Yankee Homecoming Firworks by purchasing or renewing your Newburyport App and VIP Card. The VIP Program allows you to enjoy discounts at 180 restaurants and shops in the Greater Newburyport community and $10 of each purchase or renewal can be donated to the Yankee Homecoming Fireworks Fund. The Yankee Homecoming fireworks are set to make a bang this Saturday, August 4th at 9:15 pm with their annual display over the Merrimack River. Pack up your lawn chairs, bring blankets and snacks and grab a spot in town to watch the sky light up at one of Yankee Homecoming’s biggest and brightest events of the week. With the Yankee Homecoming fireworks going off from a barge in the river, there are tons of places around town to catch an unobstructed view of this illuminating show. 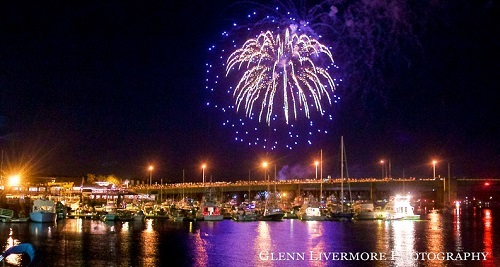 Get in on the excitement and grab a spot among the crowds on the boardwalk, Route 1 bridge or Salisbury shoreline to hear the cheers of crowds and the sounds of the boats honking. Or make a night of it and set up camp early to swing to the live music of the Compaq Big Band, a high energy 19 piece big band specializing in jazz and swing, at the Waterfront Park music series, beginning at 6 pm. 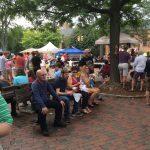 Pop into one of downtown’s numerous restaurants to grab a bite to go or stroll through the food stands set up in the square and pick up dinner and treats to enjoy during or after the show. If you have a boat, anchoring in the river is a great way to get up close to the show and avoid the crowds. But if you don’t have a boat of your own, you can still hit the open waters for the show. Many local companies offer up special Yankee Homecoming fireworks excursions, from party boats with live music to more low key family oriented atmospheres. 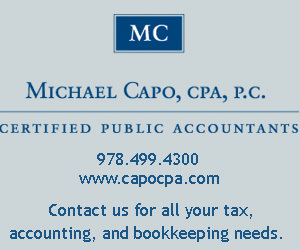 Check out Captains Fishing Cruises and Parties and The Yankee Clipper Harbor Boat Tours to name a few. 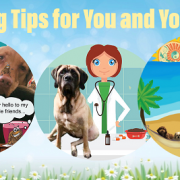 Letting your little ones stay up late for this special event? Pack a picnic dinner and head to Cashman Park to set up your blanket and chairs along the river. Your tiny spectators can enjoy the playground with other excited kids up past their bedtime while waiting for the festivities to start. No matter where you choose to watch, come early to claim your viewing spot and enjoy the buzzing downtown area on this special night filled with live music, entertainment, food and shopping. Be sure to check our Events Calendar for any changes or updates do to weather. 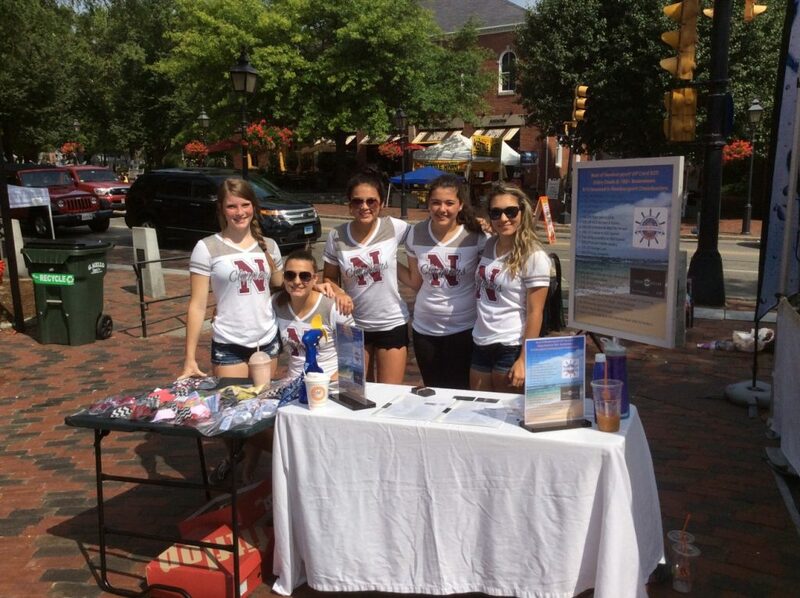 If you would like to support the Yankee Homecoming fireworks, consider purchasing a Newburyport VIP Card today. The VIP Card gives you discounts EVERY TIME you make purchases at 180 local restaurants and shops and you can choose between a Digital VIP Card in the Newburyport App or a Physical VIP Card. Purchase one for $25 or two for $40 and donate $10 of your purchase to the Yankee Homecoming Fireworks Fund.